Until fairly recently, most industrial platform scales were completely mechanical, with each corner of the scale’s platform supported by a bearing that rested on a set of pivots. These pivots were supported by a single understructure device, which was itself supported by another lever system with a 14 to 1 mechanical advantage. This lever was attached to a spring type dial or a counterbalanced arm. With a standard capacity of about 1,000 pounds, the counterbalance could handle a maximum force of about 70 pounds. The problem with this construction was that the pivots and bearings would wear down after moving against one another for an extended period of time, causing inaccuracies and high costs for regular service. Due to the relationship of the pivots, bearings, and levers in the construction, the scale’s platform height was six inches or more, making it difficult to load and unload items. Costs were high due to the significant number of parts and it was impossible to integrate the scale with other systems for monitoring weight or recording data. Neither accurate nor convenient, they have been replaced with digital platform scales. The first types of digital scales replaced the counterbalance with a single load cell, which is a sensor that converts mechanical force into an electronic signal. This signal would then be amplified and converted from analog form to digital so that the measurement could be displayed numerically on an electronic indicator. These digital scales provided many advantages to industries requiring weight measurements. First, measurements were much more easy to read than those given by mechanical scales. Second, digitalizing scales made it possible for them to interface with other devices such as printers and computers. Still, these scales were prone to inaccuracies and required regular service like their mechanical predecessors. Further improvements were made when a single load cell with a large capacity was placed directly in the center of the scaleÕs platform, which eliminated all of the pivots, bearings, and levers. However, this still posed problems because extremely large load cells were required to compensate for offcentered loads. This was not only costly, but still made the height of the platform inconvenient for easily loading and unloading items. Early digital scales were also at a disadvantage because the size of the platform had to be kept fairly small, around 20 x 27 inches because of the problems the single, large load cell caused. Also, movement of the platform often occurred due to the fact that loads are generally not placed directly in the center of the platform, ultimately causing weakness and damage that resulted in inaccurate results and a call for service. In the industry for over thirty years, we were fully aware of the issues that arose from both mechanical scales and their early digital replacements. This is why we place not one, but four load cells in each scale Ð one in each corner of the platform. Made from stainless steel rather than the industry standard of aluminum, our load cells are able to withstand shock, overload, and general wear and tear better than other scales. While digital scale construction has come a long way, we realize that the two standard weighing technologies, strain gage and magnetic force restoration, don’t provide the accuracy or cost effectiveness many industries require. Because strain gage technology does not provide the necessary degree of flexibility in terms of load capacity and accuracy for many industries and the exorbitant price of magnetic force restoration scales makes them impractical options, we engineered and incorporated a new technology into our scales, which makes them just as accurate as strain gage scales and much less expensive than force restoration scales, called Surface Acoustic Wave technology. Using transducers, a device that converts two different energies, in this instance pressure to an electrical signal, scales with surface acoustic wave technology are able to provide one one-hundredth of one percent accuracy as opposed to the one-tenth of one percent accuracy provided by strain gage scales. A transducer’s substrate material is a crystalline structure composed of lithium niobate, which transmits a bulk wave. Acting as a transmitter, a metalized pattern creates the wave when a load is placed upon the platform. The wave then travels the length of the transducer to a second, parallel substrate known as a receiver, which amplifies the signal and feeds it back to the transmitter. The displacement of the spring element, and ultimately the weight of an object, is determined by the distance between the transmitter and receiver and the frequency of oscillation between the two. This all-digital system provides unrivaled accuracy that is ten times more precise than standard scales, even at large capacities, with twenty times better resolution. Because there are no moving parts, unlike other digital scales and mechanical scales, there is no need for regular service or repairs. Because we use four smaller load cells rather than one large one, we have been able to reduce the platform height of the scale to 1.875 inches high, making it easier to load and unload items being weighed. We also offer several different connectivity options for easy data transfer including Ethernet, set point, RS-232, RS-485, USB, and a datalogging option, which allows the recording of measurements on an SD memory card that can be removed and viewed on a personal computer using Microsoft Excel. 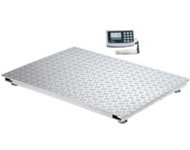 Arlyn Scales is a manufacturer and distributor of weighing equipment for a variety of industries. Manufactured in our Long Island warehouse, we ship our products factory direct, cutting out the middleman that drives up our competitors prices. We never buy foreign and rebrand because we prefer to monitor the quality of our products at home, ensuring that you receive the most accurate, rugged, and efficient tool to manage your operation. Browse our selection of high accuracy scales to find one best suited to your needs. If you cannot find a scale that meets your requirements, please don’t hesitate to contact us as we can craft a custom option at an affordable price. We can be reached at 800.465.4301.